Adapted by Richard LaGravenese (The Horse Whisperer, The Bridges of Madison County, The Fisher King) from Sara Gruen’s 2006 bestselling novel, and directed by Francis Lawrence (I Am Legend, Constantine), Water for Elephants marks the latest bid by Robert Pattinson to obtain middlebrow, mainstream success outside of the Twilight franchise. The goal, at least so far, has eluded Pattinson and his Twilight co-star, Kristen Stewart. Starring roles in Remember Me and Little Ashes failed to draw Twilight’s enthusiastic fan base to multiplexes in noticeable numbers. Water for Elephants probably won’t change Pattinson’s luck at the box office, but it does, offer proof that Pattinson can act — at least better than anything we’ve seen from him as Edward Cullen — and that can pick challenging, rewarding roles for Pattinson to show different facets of his acting talents. Water for Elephants opens, Notebook-style, as a nursing home escapee, Jacob Jankowski (Hal Holbrook), reminisces about his earlier life during the Great Depression to the circus manager, Charlie O’Brien (Paul Schneider). A veterinary student at the Cornell School of Veterinary Science, Jacob (Pattinson) suffers a breakdown when news of his parents’ death in a car accident reaches him just as he’s taking a final exam, the last final necessary to complete his veterinary degree. Emotionally shattered and penniless, Jacob drops out of school and literally jumps a train transporting the “Benzini Brothers Most Spectacular Show on Earth,” a fictional Ringling Bros. rival, to their next engagement. Almost “red-lighted” (i.e., thrown off a moving train in circus lingo) when discovered on the train, Jacob is saved when Camel (Jim Norton), an elderly roustabout with a compassionate streak, decides to take him in. In the morning, Camel gives Jacob the worst menial tasks, but Jacob comes to the attention of the circus’ owner (the novel’s Uncle Al character doesn’t appear in the film adaptation), August Rosenbluth (Christoph Waltz), when he diagnoses a potentially fatal injury to one of the circus’ star animal performers. Rosenbluth makes Jacob the circus’ resident veterinarian and names him the “bull man,” the animal trainer in charge of the circus’ latest addition (and attraction), Rosie, a bull elephant. Rosenbluth (Christoph Waltz) is by turns capricious, cruel, and charming, the circus a fiefdom he rules with impunity (and several oversized henchmen). Circus workers often disappear in the night, red-lighted. Performers, including his wife, Marlena (Reese Witherspoon), the circus’ equestrian specialist, are treated like chattel. Jacob unsurprisingly grows close to Marlena, setting up the film’s central conflict, a romantic triangle with the unstable, violence-prone August, and Jacob and Marlena. With the exception of the present-day bookend scenes, Water for Elephants looks and sounds like a long lost, albeit minor color film made in the late 1930s or early 1940s. 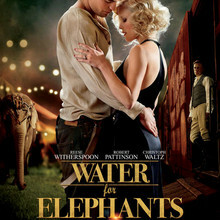 Water for Elephants is, as amply advertised, a throwback tearjerker. No one, of course, should expect much thematic depth or narrative complexity. It’s not that kind of film nor was it meant to be, but it is surprisingly affecting, due in no small part to Pattinson’s performance as Jacob. Pattison is asked to dig deep into Jacob’s emotional life, and he delivers a convincing persuasive performs. As Marlena, Reece Witherspoon doesn’t fare as well, but that’s more a problem with her underwritten role than her performance. As Rosenbluth, Christoph Waltz, an Oscar winner for his supporting turn in Inglourious Basterds, delivers a performance that borders on caricature but never fully crosses over. For his next English-language role, however, Waltz should try playing something less villainous or risk being typecast (if he isn’t already).